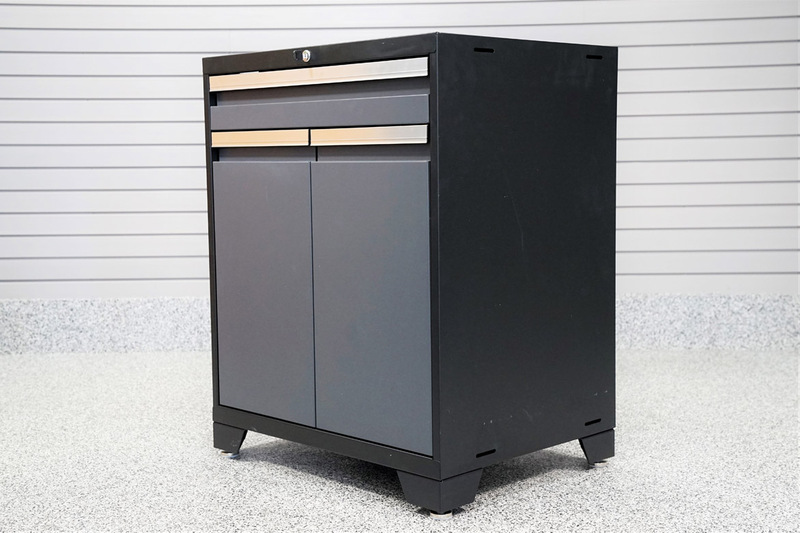 The Pro Plus Series 2-Door Base Cabinet offers you total durability and maximum storage space. Includes a pullout steel shelf and a cable management solution. Includes an interior pull-out shelf with soft close drawer slides. Designed to offer convenient access to those quick-grab items our Pro Plus Series Tool Drawer has five fully lockable drawers to offer the peace of mind that your gear stays safe and organized. 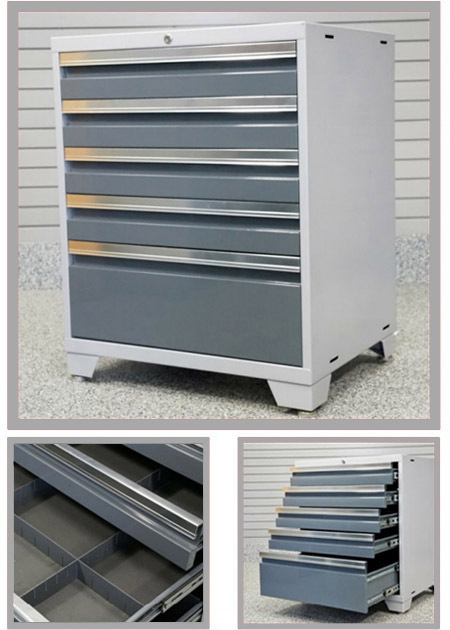 Includes 5 full extension drawers on double ball bearing soft close slides. Top 4 drawers each include 3 adjustable dividers for organizing. 100lbs weight capacity per drawer. 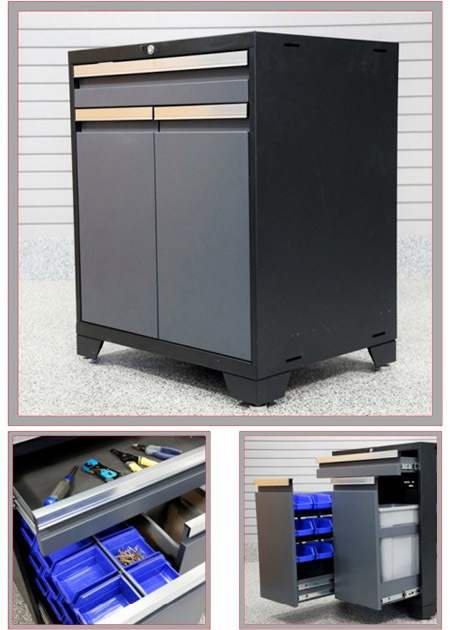 One cabinet with many functions the Multifunction Cabinet includes a tool drawer, a small parts drawer with 24 small storage containers and 1 recycling or garbage bin drawer. Multifunction Cabinet has 1 top drawer, 1 Parts Organizer drawer, and 1 Recycling/Garbage Bin drawer. Your cabinet set is not complete without a highly durable and strong worktop. Our Pro Series Worktops add a clean, sleek look to your cabinets. Built 24" deep, our worktops give you plenty of room to complete your project. 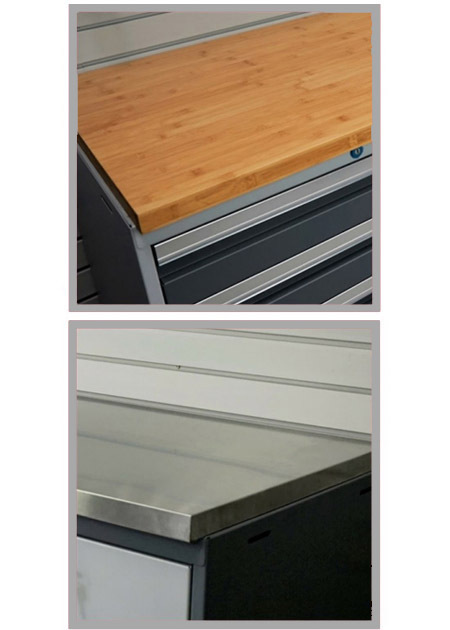 The solid 1-1/4" thick Pro Series worktops are available in both Stainless Steel and Bamboo finishes. Heavy duty finish that wipes clean. Solid Worktop core allows for easy installation. Designed to fit perfectly over our Pro Series cabinets. Are you looking for garage base cabinets? Potomac Garage Solutions has been offering a wide variety of garage cabinet services for many years throughout the Maryland, Virginia and Washington DC areas with professionalism, craftsmanship and great customer care. 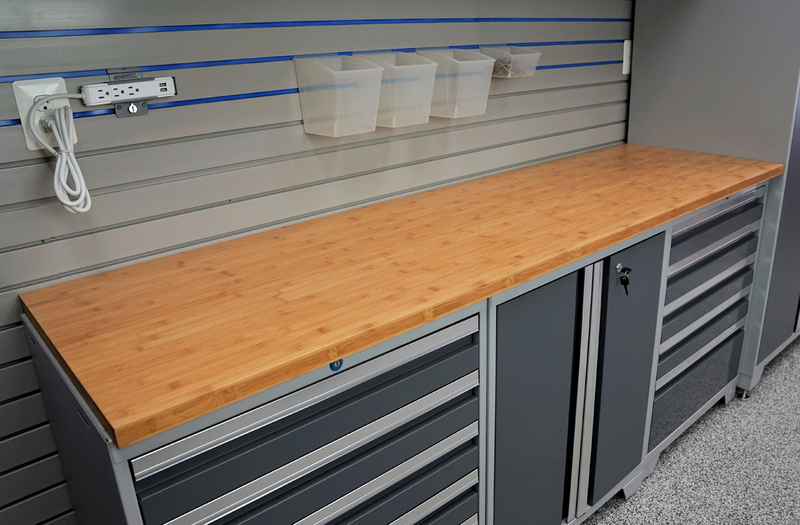 Since 2003, our master garage professionals have been installing quality garage base cabinets with precision and durable materials that are built to last. Our garage base cabinets come in many configuration and color options to accommodate your unique garage renovation project. Our garage professionals have the experience and skills to transform unorganized, cluttered spaces into fully functional living spaces that meet your family and storage needs. At Potomac Garage Solutions, we work tirelessly, use expert installation methods, and industry leading materials to ensure our clients are fully satisfied with the overall outcome of their project. 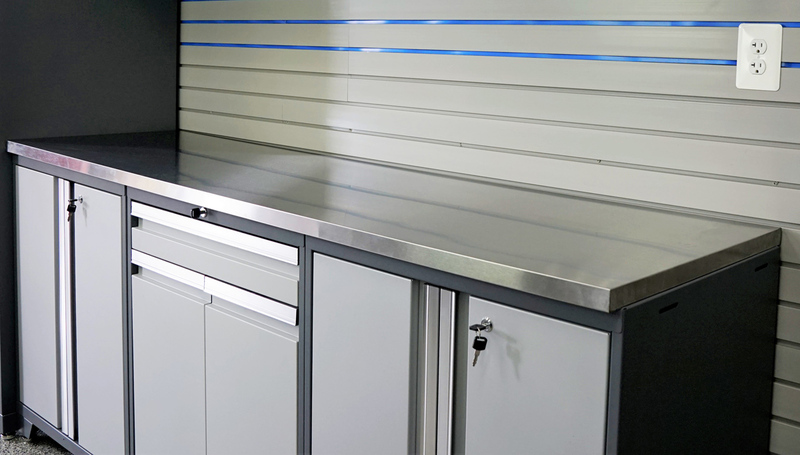 Our garage base cabinets consist of fully welded steel frames and double-walled doors for durability and structural integrity. 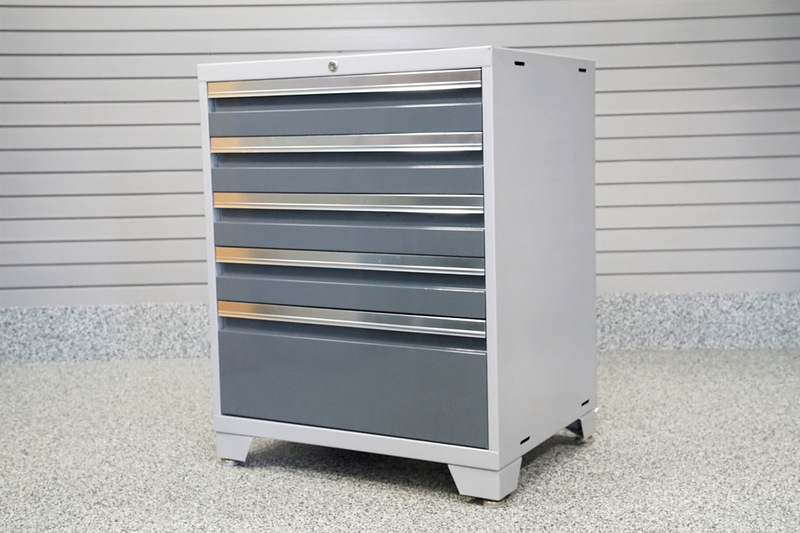 Our garage base cabinets have an industrial strength powder coated paint finish that is scratch and stain resistant, tough enough for every garage environment. All the cabinet doors have adjustable, soft-close hinges for smooth and silent opening and closing. 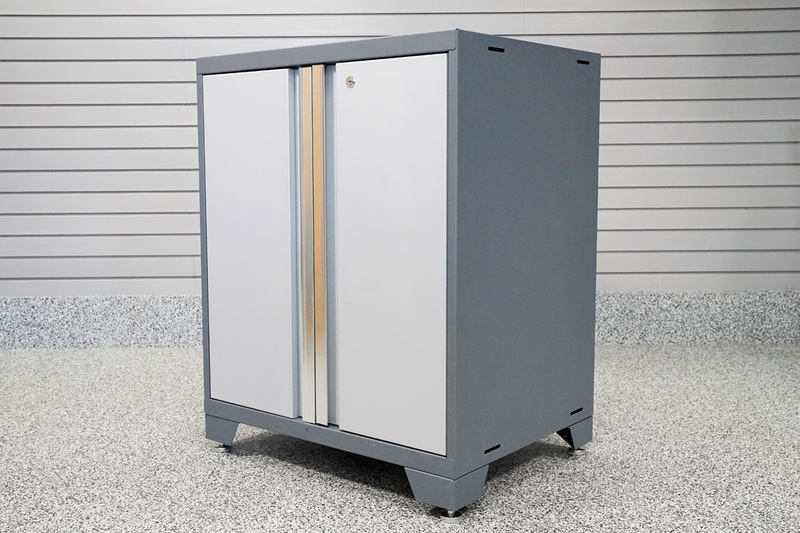 Our garage base cabinets have a weight capacity of 1,000 pounds and are equipped with integrated cable access holes and textured chrome handles and locking latches. Our lockers include adjustable shelves and hanging pegs with closet rod to custom organize all your gear. The base cabinets can be finished with either bamboo or stainless steel worktops. 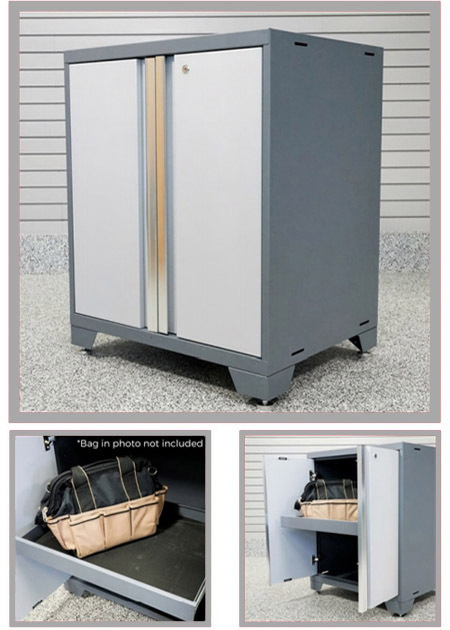 Custom cabinet installation is included - our garage base cabinets can be installed on the floor with adjustable legs, on casters for easy maneuverability or mounted on the wall to maximize floor space. For more information about our garage base cabinets, contact Potomac Garage Solutions today at 240-650-2622.